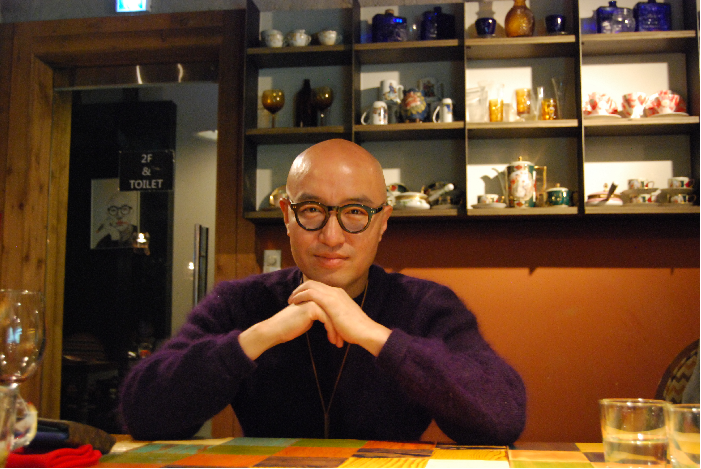 Hong Suk-cheon, who graduated from the Department of Theater and Film at Hanyang University (HYU), is a familiar face to the public, due to the many careers he takes on. He is not only an actor and active celebrity who stars in variety shows like Please Take Care of the Refrigerator, but also famous for his line of restaurants, mostly located in Itaewon. In following his culinary passion, he is also the director of the Korea Culinary Arts Academy. Furthermore, as an author, he has published a personal essay, Splendidly 47 Years, which allows readers to get to know about his amazing life story and his beautiful inner side. 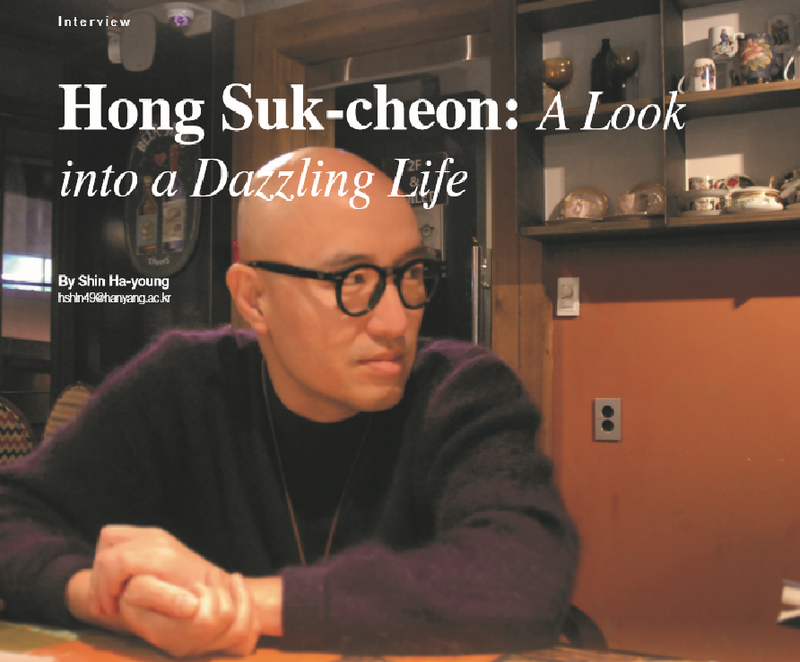 The Hanyang Journal had an opportunity to meet with Hong Suk-cheon, and ask him about his life as an actor, restaurateur, professor, and author. Q. Did you always want to become an actor, or was there any special event that happened in your life that prompted you to become an actor? A. I have always wanted to become an actor, which is the reason why I worked to get into HYU’s Theater and Film Department. However, after a while, I couldn’t help but fear about my success as an actor. Back then, only the people who were cast in main roles were given the opportunity to become famous. I guess this fear prompted me to not just wait for someone to give me that opportunity, but to find it on my own. This is why I auditioned for so many commercial plays while I was a student. I don’t regret doing these plays, because the experience taught me how to deal with a wide variety of people. I even auditioned to become a comedian and luckily had the opportunity to work as a comedian for three months too. Q. We heard that you just finished acting in Liar as Bobbly Franklin. What are your thoughts about the play coming to an end? A. I’m just happy that it was a success. As actors, we usually start projects without even the vaguest inclination of it being a success or not. However, I was happy that Liar ended successfully, and it was a comfortable environment to work in since I had the chance to work with people that I already knew. Q. Are there any roles that you want to play in the future? A. I do want to try out for more friendly roles, like being a friendly uncle to the main character in a weekend drama. However, even though I might have this wish, I have been given roles that directors and producers know that I will be able to do well. Q. We are aware that you are often called the “King of Itaewon” because you have so many restaurants located there. I’m sure our readers are wondering, why have you named all of your restaurants starting with the word ‘My’? A. Usually when celebrities open a restaurant they name it after themselves. However, I put ‘My’ because I planned to run many restaurants even when I opened my first restaurant. If I named a restaurant using my name, then customers will naturally expect me to be there and will be disappointed if I’m not. Moreover, the concept is also similar to Apple’s ‘i series’. I wanted to make people recognize restaurants and cafes that were owned by Hong Suk-cheon and not be disappointed with the Hong Sukcheon brand. Q. How many restaurants and cafes do you own in Itaewon? Moreover, how do you juggle your personal time while managing such a huge culinary business? A. I don’t usually pay attention to the number of stores. The numbers are not important to me as I keep challenging myself to run more restaurants. As for the way I manage my time, I guess it is safe to say that I don’t have much personal time to manage. I have been continuously working in order to handle all of the careers that I have. Q. Developing menus and recipes is quite the feat. How do you come up with these great ideas? A. I learn by communicating with professional chefs. Additionally, I credit traveling as a reason why developing menus comes so naturally to me. I often travel either for shooting a program or for personal pleasure. When I visit other countries, I get to experience unique traditional cuisines offered in that country. Then after the trip, I come back to Korea and develop recipes of foreign cuisine that are adjusted to the taste of Koreans. I would like to point out that I am not a chef, but I am a restaurateur, someone who comes up with the overall concept and the ideas of a menu. Thus, I am in a position where I can openly add creative ideas on the menu. Q. What is your philosophy of running your own restaurant? A. My philosophy is to run a restaurant where customers can eat to their heart’s content without having to worry about the food being too expensive. However, it is difficult to maintain such an attitude as the cost of materials, personnel expenses, and the rent is constantly increasing. Therefore, I am considering other factors that can satisfy customers. Q. You recently published your personal essay Splendidly 47 Years this May, and in this, you have explained your long acting, entertainment, and culinary career. Which career suits you the most? A. It is, of course, working as an actor and entertainer. I see my greatest asset as my unique personality. To make it simple, if I design clothes in the future, I want people to instantly know that they were made by ‘Hong Suk-cheon’, based on my personality that they have seen over the years through different shows. I want people to have expectations that the product will be special and beautiful because it is branded by ‘Hong Suk-cheon’. Q. I have read that one of the reasons why you are active in various fields is to become a role model for people who are in the “same position” as you. Can you elaborate on what you meant by “same position”? What kind of messages did you want to deliver to them? A. There are many people who give up their dreams because of an identity crisis. I wanted to show them that since I overcame such difficulties, there is no reason for them to hesitate to achieve their goals. It was hard for me back then, because there was no precedent that I could look up to as a role model; especially regarding my sexual identity. That personal experience pushed me to want to be a role model who can help others to work hard towards their dreams. Q. Were there any positive aspects of revealing your sexual identity to the public? A. The positive thing was that I was able to find myself and be myself. Life is very short so it is important to think about how to spend time for yourself. Moreover, I would like to advise the younger generation to specify their dreams and never feel intimidated by the big dreams they might have. For instance, since my main job is an entertainer, my restaurant business also relates to that job as I appear in cooking programs. All of my careers are actually linked together as one big dream. Q. Even though society has become somewhat lenient in regards to sexual minorities, changes and efforts are still needed. How do you think accepting the sexual minorities should be addressed? A. For a long time, our country has been putting a lot of efforts to become an advanced country. What’s interesting is that our economy might have developed, but the way people think and act still needs refinement to be on a similar level as that of other developed countries. Tolerance for others should be an important aspect in our society. In other countries, all systems are constructed and became developed countries as people recognize and understand others who are different from themselves. For example, we need to publicize issues regarding problem like AIDS rather than blaming it on the sexual minority. Q. You seem to have a very wide network of people that you know personally. How do you know so many people when going on a ‘relationship diet’ is such a new trend? A. I understand that going on a ‘relationship diet’ is important because it helps you become the center of your life. However, I also believe that going on such a diet only applies to people who actually do have enough relationships or have a job that requires them to have fewer relationships. In my case, various relations are needed due to the jobs I have, which is why I maintain such a wide network of people. However, I worry that many young people will follow this trend without knowing these qualifications. Q. What is your motto or tip that you get through hardships? A. These days, my motto is, “Be a happy third placer.” I like being third. People who place first stress themselves out by trying to maintain that position, while people who are in second place suffer from the pressure of being chased by the third and the need to chase the first. On the other hand, when I place third, I don’t have to worry about such stress nagging at my consciousness. Additionally, people have less expectation towards me when I place third. However, being in third place is no excuse for not working hard. You should work hard because you never know when the opportunity to go higher will be given to you. Q. What are your plans for the future and what is your final goal? Q. Lastly as a senior of HYU, what would you like to say to the younger students in HYU? A. First, develop your own abilities. If it is difficult, then get into a group of people who can agree with each other. Students in HYU are not your competitors. Instead, it would be better if you harmonize with those people as many competitors are outside of the university. Regionalism and school relations are things that society wants to abandon. However, at the same time, there are some factors that people cannot change in their lives. This is a part of it. Students have not realized that fact and have been competing with each other in a “small world” while people in the world where there is a development of communications technology are the ones that they will actually have to face during their social lives.